Courtesy of a gem of an innings by Colin Munro, India lost a T20I series for the first time in 30 months. Having batted first, the Kiwis posted a mammoth total of 212/4 in their allotted 20 overs. The Indians would have recorded their highest successful chase in T20I’s if they would have chased down the target successfully, however, they lost the encounter by a mere 4 runs, thus conceding the match and the series. Colin Munro for his blistering innings of 72 was handed over the player of the match trophy, while Tim Seifert was declared the player of the series. Having won the toss, Indian captain, Rohit Sharma decided to bowl first. The Kiwi openers dominated the Indians from ball one, putting on an 80-runs partnership for the first wicket before Kuldeep Yadav dismissed Tim Seifert for 43 runs in the 8th over. 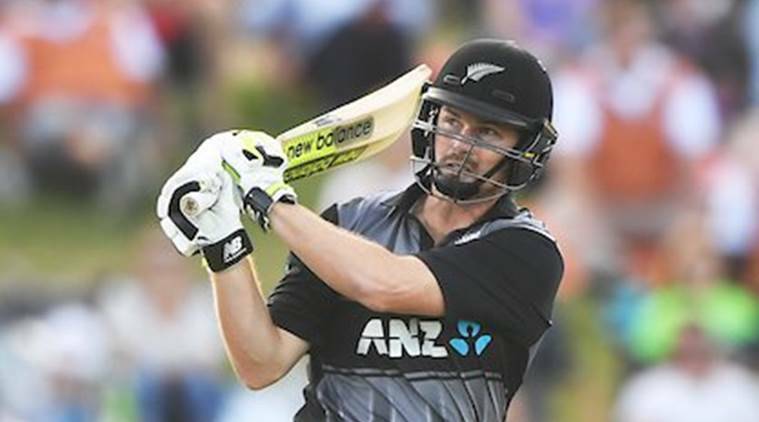 Another 55-runs partnership flourished between Colin Munro and Kane Williamson that placed the Kiwis at a strong position, putting up 135 runs in 13 overs, before Munro departed after being dismissed for 72 by Kuldeep. On the very next over, Khaleel Ahmed sent back Kane Williamson to the Kiwi dressing room as New Zealand were 150/3 in 14.4 overs. Another 43-runs blitzkrieg partnership of mere 22 deliveries lifted the Blackcaps to 193 runs in 18.4 overs before Bhuvneshwar Kumar got the better of Colin de Grandhomme and dismissed him for 30. However, the Kiwis managed to score 19 of the last 10 balls to post 212 as their final total. Kuldeep Yadav for India starred with the ball, giving away 26 runs and picking up 2 crucial wickets; however, the rest of the Indian bowlers leaked away a lot of runs that enabled the Kiwis to post such a mammoth total. The Indians in response lost Shikhar Dhawan as early as in the first over. But a 75-runs partnership between Rohit Sharma and Vijay Shankar ensured that the Indians were still on the hunt to chase down their highest total in T20I internationals. However, Mitchell Santner dismissed Shankar to reduce the visitors to 81/2 in 8.3 overs. Another thunderous partnership between Rishabh Pant and Rohit added 40 runs in 19 balls for India before Pant was dismissed by debutant Blair Tickner as the Indian score read 121/3 in 12.2 overs. Further wickets of Rohit Sharma, Hardik Pandya, and MS Dhoni put brakes on the Indian chase as now they were requiring 68 runs in just 28 balls. A brave effort by Krunal Pandya which was ably supported by Dinesh Karthik helped India to reach 208 in 20 overs, thus losing the game by 4runs. Colin Munro was adjudged the man of the match, while Tim Seifert was adjudged the player of the series. New Zealand now face Bangladesh at home for a 3-match ODI series and a 3-match Test series, while India play Australia for a 2-match T20I series and a 5-match ODI series at home before the start of IPL.